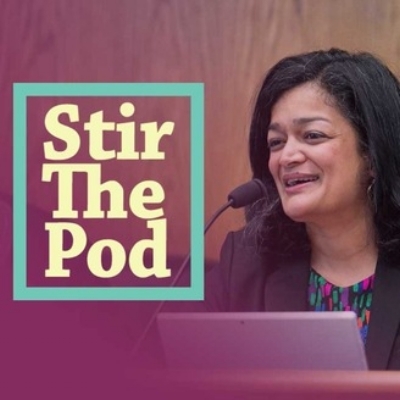 On Stir the Pod, Rep. Jayapal lifts up the voices of people working for progressive democracy - and stirs things up! In the aftermath of the Parkland shooting, Congresswoman Jayapal joins high school students from throughout Seattle and surrounding areas in a conversation about how to organize to stop gun violence. Joining me for my very first episode are Black Lives Matter co-founder Alicia Garza and Woman's March co-chair Linda Sarsour! We discuss the Woman's March, Oprah and the Golden Globes, and our organizing tactics for 2018. In part one of this episode, I'm joined by John Nichols, National Affairs correspondent for The Nation, to discuss a recent string of unlikely Democratic victories in traditionally Republican districts, from Wisconsin to Alabama. How we can build on this momentum and carry it forward? I also reflect on the government shutdown and how Democrats should be standing strong for Dreamers. In part two, I'm thrilled to talk with Elizabeth Guzmán, the new Delegate representing Virginia's 31st District. She is a fellow immigrant, strong woman of color, and unapologetic progressive who defeated an eight-term Republican incumbent to become one of the first Latinas ever elected to the Virginia State House. And I discuss #MeToo, Rob Porter and the White House's shameful handling of domestic violence allegations against him.